1. Now the heavyweight champion, Rocky embraces his role as pitchman. Which product is not one of his endorsements? 2. What is Paulie arrested for in the beginning of the film? 3. What car is Rocky driving these days? 4. Which real life celebrity has a cameo in the movie during a charity bout? 5. What is the name of Hogan's character? Thunderlips claims he's the "ultimate male" fighting the ultimate meatball. 6. Who wins the match between Rocky and Thunderlips? 7. Where does Clubber Lang challenge Rocky in person to fight? 8. According to Mickey, what's the worst thing that can happen to a fighter? 9. Rocky's loving the life a little too much. Which one of these is not a feature of Rocky's plush new training gym? 10. In an interview leading up to his fight against Clubber, what does Rocky speculate he might to do after it's over? 11. How many times has Rocky defended his title before fighting Clubber? 12. At what stage in Mr. T's acting career was Rocky III released? The A-Team premiered eight months after Rocky III. 13. In a shocking upset, Clubber Lang is declared the new heavyweight champion. How many rounds did it take? Let's blame this one on Paulie's cornerman advice. 15. In what year was Mickey born? 16. Rocky's previous training regimens included punching slabs of meat and chasing chickens. Which one of these does Apollo have him do? "Can he swim?" "With a name like Rock?" 17. Where does Apollo take Rocky to begin training for his rematch against Clubber? Los Angeles is where Apollo got his start. 18. Confronting Rocky about his flagging commitment to training, Adrian demands to know the truth. What's the truth? 19. Where is the rematch with Clubber Lang held? 20. 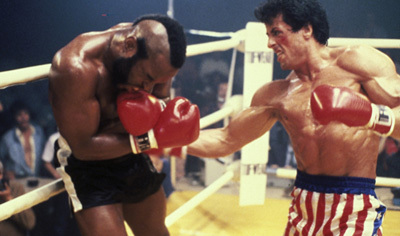 What is Clubber Lang's prediction for the rematch fight? 21. What gift does Apollo present to Rocky before the rematch? 22. This is Rocky's mouthiest fight yet. Which taunt is not one of the ones he uses in the ring? "You're getting uglier by the minute." "Come on, knock me out." "My mother hits harder than that." 23. What's the favor that Apollo's been expecting ever since he agreed to train Rocky? 25. Which one of these categories earned Rocky III an Oscar nomination? This movie cemented the connection between Rocky and "The Eye of the Tiger."